ECHOLASER Therapy is a micro-invasive percutaneous procedure that uses the laser light transmitted by the applicators (optical fibres) for a few minutes. This heats the targeted tissue and causes irreversible “in situ” damage, therefore with no need to remove it. This is all thanks to the combined action of an encrease of the local temperature and exposure time. The interaction of the laser radiation with a 1064nm wavelength (within the range of the therapeutic window) provided by ECHOLASER is excellent, offering low radiation absorption and excellent light penetration. The laser light is conveyed by the source to the tissues through extremely flexible quartz optical fibres with a small diameter (300 micron) and a flat tip, which are inserted percutaneously with fine needles (21 Gauge). ECHOLASER therefore introduces the concept of micro-invasiveness thanks to the use of very small gauge applicators (<0.8mm), which makes this the best approach in non-traumatic terms. It also introduces the concept of multi-applicator approach offering the chance of treating lesions with a far wider size range. 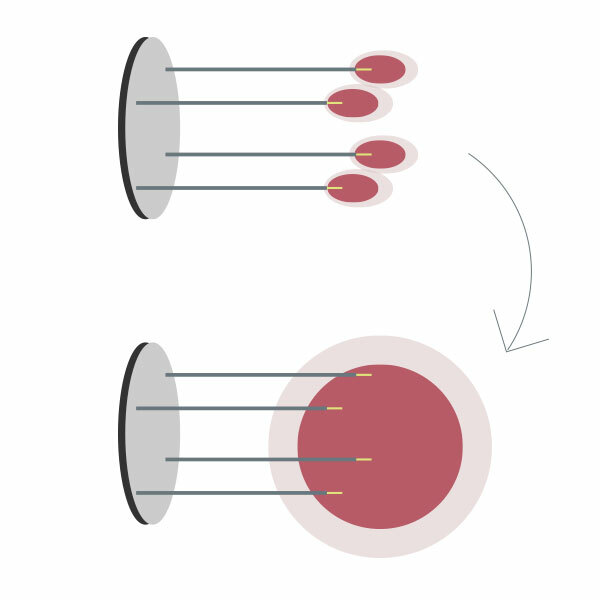 Through the flat-tipped fibres, the EchoLaser Therapy produces a coagulation area (area where the tissue is irreversibly damaged) with an ellipsoidal shape. The EchoLaser Therapy can also be carried out with ultrasound guidance for real-time monitoring of the correct positioning of the laser light applicators and the actual extent of the damage caused to the tumour. The EchoLaser Therapy can be applied on both benign and malignant lesions in various organs (soft tissues). The concept of EchoLaser Therapy is broader than more commonly used Thermoablation. In case of malignant lesions (e.g. metastatic lymph nodes) ECHOLASER provides a highly precise approach, very useful on small lesions with uneven borders. On benign lesions (e.g. thyroid nodules or BPH), ECHOLASER induces a controlled cytoreduction whith a consequent improvement of local symptoms. The intrinsic features of Laser (coherence, collimation and monochromaticity) and the penetration method of the laser into the tissues (depending on the wavelength) make the EchoLaser Therapy a successful choice. Laser energy is well tolerated by the body (with a very low risk of complications). a localized effect on the treated area with clearly defined borders.